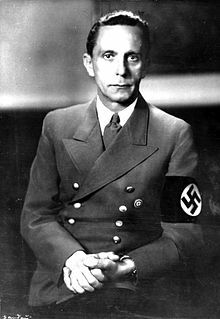 Paul Joseph Goebbels 29 October 1897 – 1 May 1945 German politician, Reich Minister of Propaganda of Nazi Germany 1933 – 1945. He was one of Hitler’s closest associates and most devoted followers, known for his skills in public speaking and propaganda, and his virulent antisemitism, advocated the extermination of the Jews in the Holocaust. Goebbels, earned a PhD in German Philology in 1921. In 1924 he joined the Nazi Party and after becoming district leader) for Berlin in 1926, he began to use propaganda to promote the party. After the 1933 Nazi seizure of power, Goebbels’ Propaganda Ministry took control of all German news media, arts, and information and turned them to propaganda purposes. Common topics included antisemitism, attacks on Christian churches, and shaping war morale. In 1943 he pressured Hitler to introduce “total war” – ending all business and activities not committed to the war effort. By war’s end, he and wife Magda had joined Hitler in the Berlin underground Vorbunker, where they followed Hitler into suicide after poisoning their six children with cyanide. are confident they are acting on their own free will. …the rank and file are usually much more primitive than we imagine. Propaganda must therefore always be essentially simple and repetitious. Propaganda is not an end in itself, but a means to an end. If the means achieves the end then the means is good… the new Ministry has no other aim than to unite the nation behind the ideal of the national revolution. Good propaganda does not need to lie, indeed it may not lie. It has no reason to fear the truth. It is a mistake to believe that people cannot take the truth. They can. It is only a matter of presenting the truth to people in a way that they will be able to understand. A propaganda that lies proves that it has a bad cause. It cannot be successful in the long run. When reading these propaganda principles, keep in mind that they were applied in wartime (WWII) and involve issues that don’t arise otherwise. It’s a long list, but Goebbels was dealing with the complexity of an all-out war. While reading them you may realize that some of the principles are generally applicable and not limited to wartime. Some might be quite familiar today. It is interesting to note that Goebbels’ principles derive from Hitler’s own ideas of propaganda. It must oversee other agencies’ activities which have propaganda consequences. Propaganda must affect the enemy’s policy and actions. The purpose, content, and effectiveness of enemy propaganda; the strength and effects of an expose’; and the nature of current propaganda campaigns determine whether enemy propaganda should be ignored or refuted. Material from enemy propaganda may be utilized in operations when it helps diminish that enemy’s prestige or lends support to the propagandist’s own objective. Enter your email address to follow this blog and receive notifications of new posts by email. No salesman will call.